Am I losing quality of the pictures when the size of the file drops? My daughter is sending me some JPG pics to edit for her. The file sizes start around 11MB & 3264x4928. After I do some mild teeth whitening, lint removal, and cloning to fix a few things the file size drops to between 1.5-3MB though the resolution stays the same. I'm saving them at the highest quality it gives me (I think). I've used Adobe CC and am currently using GIMP. I've read through many of the posts but they are way over my head. If I need to keep them up near their original file size I'm not sure what I'm doing wrong. You lose quality every time you save a jpeg file: JPEG is what's referred to as 'lossy compression'. But that's okay - with the original file size you describe, the image is, for your purposes, as good as a losslessly compressed one. What makes JPEG compression 'lossy'? Simply put, JPEG reduces the detail of the picture, attempting to reduce the kind of detail that is the least noticeable to a human person. With higher quality settings (resulting in larger file sizes), the loss of detail may not be noticeable at all. With lower quality settings (resulting in smaller file sizes), it will reduce fine details (like small leaves in a tree, hair, freckles) and introduce compression artifacts (well illustrated in the Wikipedia article on JPEG). When you open a JPEG, it is decoded (because the program does the editing on an uncompressed copy of the picture in the computer's memory), but that doesn't make the picture quality any better: If you open a low-quality JPEG in your picture editing program, the artifacts stay and the details remain lost. If you save the picture again, the program takes the uncompressed picture from its memory, and applies another round of JPEG compression to that picture with all its artifacts and lost detail, getting rid of more detail and introducing more artifacts. So if you compress an picture at high-quality settings multiple times, each compression will reduce the picture's quality. There are YouTube videos that demonstrate the results of repeated JPEG compression. What's been lost stays lost forever, and each round of compression adds to the loss - a little loss for high quality settings, a lot for low quality settings. Even if you open a highly compressed (low quality settings) JPEG and save it again with lower compression (i.e. higher quality settings), you'd get a larger file with lower quality. 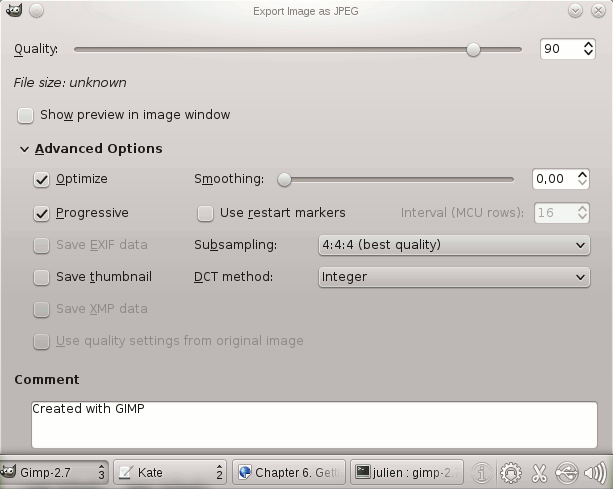 Why is JPEG still 'Good Enough'? As I said in the beginning, all is not lost for what you're doing. While it would be preferable to get pictures in a RAW format (losslessly compressed from the camera's chip), this is far more important for changing the brightness or colors of the image; retouching a picture suffers far less from previous lossy compression. Experiment a little with different JPEG compression options, and you will probably notice that with high enough quality settings (e.g. 90%) you'll get good results - the quality of the original image won't be noticeable decreased, even if you zoom in and compare specific parts of the image. RAW editing adds another layer of complexity to editing pictures too - not least of all because you'll need a different program, as GIMP can't do RAW if I recall correctly. JPEG is an image format with lossy compression. This means, every time you save a modified JPEG image, its quality gets slightly reduced because the algorithms used for encoding and compressing the information (namely DCT - discrete cosine transform) do not work pixel-perfect but only store the most important (depending on the quality/compression level) information to reproduce an image that looks basically the same to the human eye, in order to reduce the file size. To my knowledge, even the highest quality/lowest compression setting available still uses this algorithm, resulting in a minimal lossy compression and loss of information. You should also note that with relatively high quality levels, the file size quickly shrinks if you reduce them slightly while there is nearly no notable difference. In contrast, a slight change in the range of low quality levels is well visible and only has a low impact on the file size. If you want to absolutely avoid any information loss, you should work with photos in a lossless format (e.g. RAW or lossless TIFF) and only convert them to a format with lossy compression once in the end if you want smaller file sizes, don't repeatedly save in a lossy format. To simplify a bit, JPEG image compression splits the image into different frequency components and stores them separately. Depending on the compression settings, it also stores the higher frequency components with less precision, since any round-off errors in those components are less visible to the human eye. After rounding off the data, it then applies a simple variable-length encoding where smaller numbers take less space — in particular, if a lot of the higher frequency components round off to zero, they can be encoded very compactly. You're saving them with a lower quality setting. You're removing some of the high-frequency components of your images while editing them, e.g. because you're denoising them. The less noise an image has, the less space it takes up in JPEG format. You're applying chroma subsampling when saving the edited images, whereas the originals were saved without it. Chroma subsampling is a feature of the JPEG format that basically splits the image into a grayscale version, which is stored at full resolution, and the color saturation and hue, which are only stored at half resolution. Since the human eye is pretty insensitive to high-frequency color detail, this is a good way to save space, but it can sometimes cause noticeable "color bleeding" e.g. if the original image contains small brightly colored spots. To make sure you're re-saving the images with the exact same quality as before, select the "Use quality settings from original image" checkbox in the JPEG export dialog (under "Advanced Options"). This will also minimize any incremental quality loss from repeatedly decompressing and recompressing the image (although, due to creeping round-off errors, it can't entirely eliminate it). To make sure you're not blurring the images when saving them, check that the "Smoothing" slider is at zero. To preserve the metadata from the original image, select the "Save EXIF data" and "Save XMP data" checkboxes if they're available (i.e. not grayed out). Not the answer you're looking for? Browse other questions tagged jpeg file-size or ask your own question. How can I add a border to a JPEG photo without affecting quality? Why is there such a big difference with these JPG file sizes? How to recover the orginal name of picture file .JPG made by device?